Dantewada, a Maoist-affected area, has set up three polling stations in the hyper-sensitive Maoist area, which will witness voting for the first time in last 20 years. As a pitched political battle unfolds between the ruling BJP and its main challenger Congress in Chhattisgarh, another war is literally on display between the Maoists and the election authorities on walls and hoardings across the state's Maoist-hit areas. At some places, the huge banners put out by the Election Commission asking people to celebrate 'vote pandum', which in local Gondi language means 'festival of vote', actually outnumber and outsize the posters of various political parties too. Besides, many polling booths are being decorated like temples. Officials said the posters have been put up to counter the Maoist propaganda asking people not to vote. The interiors of Dantewada and Sukma regions, which have been among the epicentres of Maoism in the state, are full of posters put up by Maoists asking villagers to boycott the elections. As part of efforts to increase voting, the administration and electoral officers are also offering goodies to people, including to local women self-help groups who have been promised waiver of five per cent of their debts for bringing physically disabled persons and voters in the periphery of the Maoist-affected areas to polling booths. The poll panel is also planning to paint and colour all 232 polling stations in Sukma, considered a sensitive area, like a temple, its District Collector Amit Kumar Maurya said. "There are 40 polling stations in the district which will be shifted by either helicopter, or by cycle or by foot and in the similar way agents will go to these booths," he said. To reach some of these stations, the poll agents will even have to cross a river. During last assembly elections, 42 polling booths saw 0-10 per cent voting but the administration is trying to make voting day a festival this time, he said. "The administration wants to make the villagers feel that they are not coming to polling booth but to a temple to celebrate a festival. We are also fighting a war for the sake of democracy," Mr Maurya told PTI. He is hopeful that polling will cross 65 per cent this time in the district, compared to 48 per cent in 2013 assembly polls. Dantewada, another Maoist-affected area and an adjoining district to Sukma, has gone one step further and has set up three polling stations in the hyper-sensitive Maoist area, which will witness voting for the first time in last 20 years. 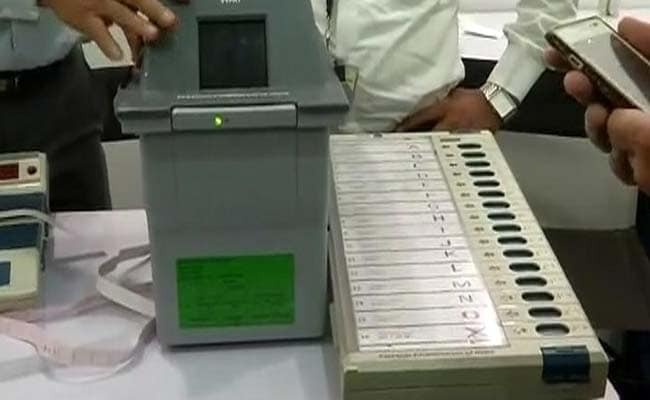 "Telam, Tetam and Gautse -- these are three polling stations, which will witness voting for the first time in last 20 years," Dantewada District Collector Sourav Kumar said. He said the district administration organised a special contest among kids in the day-boarding schools on the periphery of the Moist-affected area, to write a letter to their parents asking them to vote. On steps being taken to motivate voters in the Maoist-affected areas and for physically disabled persons, Mr Kumar said they have roped in women self-help groups for this. "The administration will waive five per cent of their debt, if their performance would be satisfactory," Mr Kumar said. These groups have a huge network in this region and can be of great help to us, he added. Dantewada had recorded more than 62 per cent voting in last assembly elections in 2013. There are 273 polling stations in Dantewada, of which 31 are "normal" and 137 "hyper sensitive". The rest are "sensitive". Talking about security scenario in the region, Dantewada SP Abhishek Pallav said adequate force has been deployed and all polling agents will be accompanied by the security personnel, comprising both local police force and CRPF. He said the biggest threat is from IEDs, spikes and pressure bombs, which are at times hard to detect, but the entire polling booth areas are being sanitised. Voting in this region will take place on November 12 in the first phase of the state assembly elections. There are a total of 12 seats in the Bastar region -- Bijapur, Dantewara, Konta, Chitrakot, Bastar, Narainpur, Kondagaon, Keshkal, Kanker, Bhanupratappur, Antagarh and Jagdalpur. Of them, eight are held by the Congress and the rest by the BJP. This region has been witness to some of the deadliest Maoist attacks in the country over several years, and some recent attacks in the run-up to the election, including one in which two policemen and a photo journalist were killed and several injured, again brought the issue of Maoism back to headlines. Polling for the 90-seat Chhattisgarh Assembly is scheduled to be held in two phases - first on November 12 for 18 seats and on November 20 for 72 constituencies. Chhattisgarh Chief Minister Raman Singh, who is seeking mandate for a record fourth time, is contesting from Rajnandgaon constituency where polling will be held in the first phase. The Congress lost to the BJP in the 2013 election as it could secure only 39 Assembly seats out of 90. The ruling BJP got 49 seats and one each was won by the BSP and an Independent.